Intimacy with God can happen right now if you want it. A closeness you can feel, a goodness you can taste, a reality you can experience for yourself. That’s what the Bible promises, so why settle for less? God is closer than you think, and connecting with him isn’t just for monks and ascetics. It’s for business people, high school students, busy moms, single men, single women … and most important, it’s for YOU. 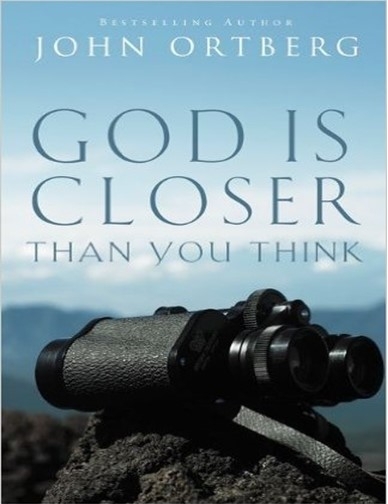 God Is Closer Than You Think shows how you can enjoy a vibrant, moment-by-moment relationship with your heavenly Father. Bestselling author John Ortberg reveals the face of God waiting to be discovered in the complex mosaic of your life. He shows you God’s hand stretching toward you. And, with his gift for storytelling, Ortberg illustrates the ways you can reach toward God and complete the connection―to your joy and his.